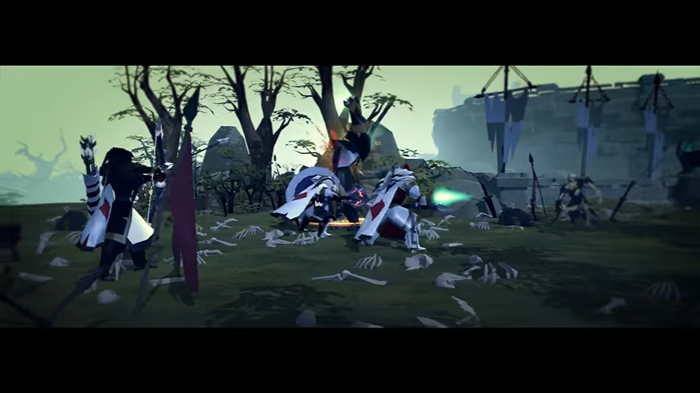 Albion Online - a project in the genre MMORPG from the studio Sandbox Interactive. The game is an isometric game in which vaguely and remotely sensed resemblance to the ultima online in the gameplay and the open world of which thousands of fans yearned. What does this mysterious Albion offer to us? Simple management, a new approach to the system of classes and skills, full-droplets and fines of death, and this is just the surface of the iceberg. The rest is hidden so deep that the player will have to try hard to cover all the opportunities that will be put into the game. • The big world is divided into zones, in each zone from 6 to 15 territories for capturing clans. In total in the game at the moment about 800 territories under the seizure. • The game economy is regulated by the players. • All objects and buildings in the game are crafted by players. • The possibility of building their own settlements. • Possibility to surrender your settlement to other guilds. • PvP & Full Loot. Total loss of things at death in PvP and PvE. • Unique character customization system. • There will be no character classes, it all depends on what kind of clothes and weapons the character is wearing. • Levels will not be as such, the pumping and development of the character will occur by performing the Destiny Board and stuffing the Fame points. • There is an indication of a variety of quality weapons, armor, resources in the game - Tier, which in the game at the moment 7, where 1 is the lowest, 7 highest. • On all platforms, one world and one server. • GvG systems and the seizure of territories. Your journey through the expanses of Albion you begin as many predecessors before you - naked and unarmed. Therefore, first of all you will have to take care of your equipment. About tools, too, should not be forgotten since without them, resources above the T1 level you do not see. A stone and a tree that is in abundance in the starting location are waiting for you when a beginner like you will borrow them. Try not to overdo it during the collection process. First of these resources, you do not need much to go to the next level, and secondly - your backpack is not dimensionless. In case of overload, the speed of movement of the character can significantly drop until your complete stop. By the way, the game does not have a system of levels and classes. The development of the character is carried out by the discovery of achievements. Therefore do not hesitate to perform all the tasks that the system burdens you, namely the collection of T1 resources and crafting of the first items. Without opening these milestones, you will not be able to go further in your development. If there are no problems with stones and wood, then for the extraction of the skin you will have to shed the first blood. Your opponent will be peacefully grazing rabbits. To refresh them, you need to craft the cutting knife. A workshop where you can make it is located in the same location. Next, you will need to craft the sword and armor. And here we are again waiting for another surprise, there are no class skills in the game at all. You will only have access to the skills that you select when creating an item. Probably this is the biggest plus and the most delicious zest of Albion Online. Not for nothing that the developers repeatedly hinted to us that we are the ones that are dressed on us. Having completed familiarity with the interface and having opened all the first milestones of character development, we boldly move on to a small settlement for beginners. Be sure to read the map (M key). It clearly shows where some workshops are located, and at the same time, your location is indicated. In general, this village will become your home town until you go to the Kraft of T4 resources and products. In addition to workshops, an auction and a repairman, there is also your warehouse and a few NPCs representing a faction of royal artisans. They can accept crafting tasks, which will be assigned a certain amount of time. The last thing you need to decide on the initial stage - the choice of the direction of development of your character. In order to be able to equip the desired type of weapon or armor, you must meet their requirements. For example, in order to use the equipment of the T2 shooting range you will have to open the "Beginner's Warrior" milestone. When you need silver in game, feel free to UpAlbion to buy what you need. We always have plenty of cheap albion online silver for sale.